The spirit of Easter is all about hope, love and new beginnings. All the colors of spring are out, the air is full of lightness and we have the prettiest Easter flower arrangements. 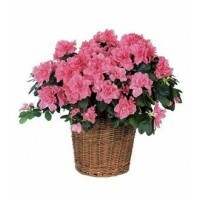 With clusters of pink flowers and lovely evergreen leaves, this blooming Azalea plant really blossoms. The perfect bit of cheer for home or office. This beautiful potted plant displays the delicate flowers that have made azaleas the perennially popular pink houseplants they are today. Safe for kids,.. The Easter Bunny himself might get just a little bit jealous, sharing the table with this pretty Easter centerpiece. Pink Asiatic lilies, purple roses, lavender daisy poms, yellow alstroemeria and mini carnations combine with a pink candle to create this holiday centerpiece. Substituti..
Take a walk through a country meadow with this fresh flower basket! Pretty blooms of pink Snapdragons and purple Matsumoto Asters nestle happily inside a natural gift basket as playful purple butterflies flutter overhead. 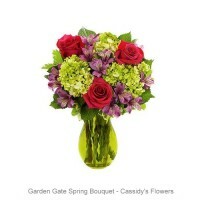 To ensure the best arrangement, flower varieties and accents may vary. .. This elegant plant with its upswept petals and beautiful green leaves, produces a whole succession of flowers over a long period, offering that special someone a whole succession of smiles. 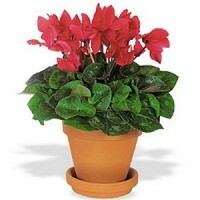 To ensure the best arrangement, flower color and container may vary. ADD SOMETHING SPECIAL TO THIS.. Nothing says spring quite like daffodils! And there's no better way to present them than in a simple, clear glass cube vase with minimal decoration. 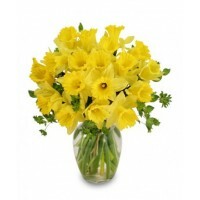 Send this seasonal spring flower at Easter, or any time you want to brighten someone's day. 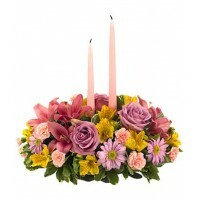 To ensure the best arrangement, flower varieties and acc.. This cheerful bouquet of lavender daisy chrysanthemums, dark purple Matsumoto asters, lavender roses, lavender cushion chrysanthemums and purple Monte Casino brings sunshine and charm to any celebration. 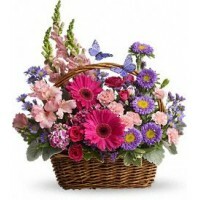 Get a handle on spring with this delightful array of floral favorites in a charming basket accen.. Whether you are simply decorating for Spring, entertaining or surprising someone special, these charming yellow Daffodils are the cream of the crop! Style of vase may vary. Substitutions may be necessary due to seasonal availability of some flowers. 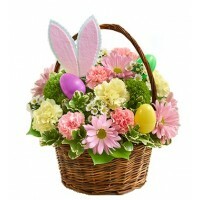 ..
Share Easter smiles with this cute basket arrangement. 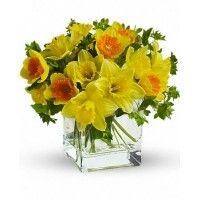 Ideal as a fun hostess gift, centerpiece for Easter celebrations or to surprise friends or family. 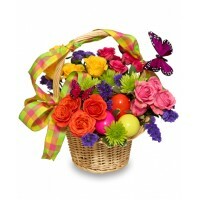 Hand-crafted with pink, yellow and lavender flowers in a handled basket. Style of basket may vary. Substitutions may be necessary due to sea.. Send an Easter Lily plant to wish a Happy Easter to relatives, friends, neighbors and co-workers during the Easter Season. 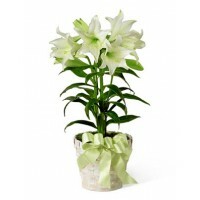 The classic White Easter Lily adds fragrance and majesty to any home or office during Easter. The traditional Easter Lily will last for weeks, then it can be replante.. 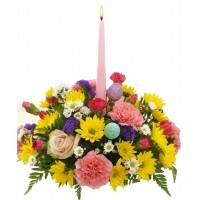 Complete your Easter table setting with this round centerpiece featuring a taper candle and an egg, yellow daisies, monte casino and pink carnations. Substitutions may be necessary due to seasonal availability of some flowers. ..
We've dressed up this adorable Easter arrangement with a Spring butterfly and festive Spring ribbon. This cute creation will surely make their holiday celebration happy! Style of basket and ribbon may vary. Substitutions may be necessary due to seasonal availability of some flowers. ..
It’s beauty-full! 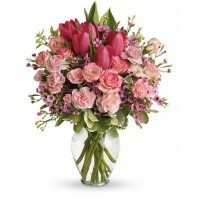 Bursting with tantalizing tulips and radiant roses, this delightful pink arrangement brings spring joy to that special someone. Style of vase may vary. Substitutions may be necessary due to seasonal availability of some flowers. .. 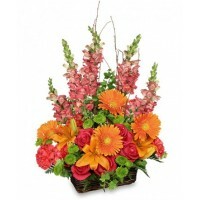 This bouquet will make your lucky recipient feel like they have walked through a magical, colourful Spring garden. Roses and Hydrangea blend perfectly to create this beautiful bouquet. Style of vase may vary. To ensure the best arrangement, flower varieties and accents may vary. Substitut..